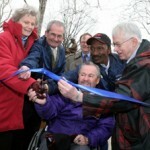 A blast of rain and winter’s remnant in north central Kentucky failed to dampen the enthusiasm of over 300 fans of Secretariat and his human connections on a cold and windy April 8, 2006 when all gathered to celebrate the formal dedication of the Secretariat Bronze in its newly landscaped location at the entrance to the Kentucky Horse Park in Lexington. 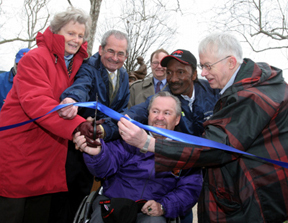 In spite of tornado warnings and severe thunderstorms the night prior, people flocked to the event Saturday morning to cheer Penny Chenery as she headlined the ribbon cutting ceremony along with family and friends from across the country. 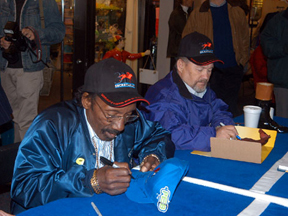 Team Secretariat was in full force with Hall of Fame jockey Ron Turcotte, exercise riders Jimmy Gaffney and Charlie Davis, and the Bronze’s sculptor Ed Bogucki all attending. After remarks by John Nicholson, Executive Director of the Horse Park, Penny addressed the large crowd, her only concession to the elements a bright red parka. She spoke for several minutes, thanking everyone for sharing the day and the achievement with her. 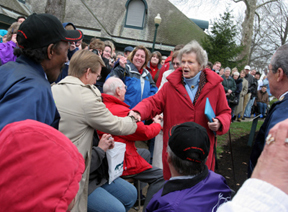 Acknowledging all the hard work, dedication and love that had gone into making her dream of creating a lasting tribute to Secretariat’s legacy a reality, Penny also thanked the contributors to the Secretariat Foundation through the Inner Circle Paver Program – whose participation was reflected in the custom pavers encircling the statue’s base. 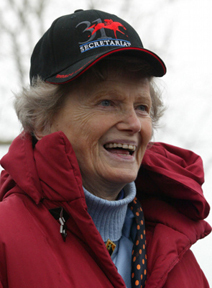 Afterwards, she and the other remaining members of the storied Meadow Racing Stable team graciously posed for photo opportunities for the fans, newspapers and film crews. 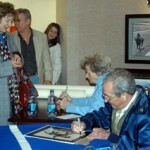 Following the dedication, attendees enjoyed the warmth of the Park’s visitor center, where the Secretariat team signed autographs and shared memories with fans. 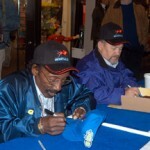 A surprise and thrill to the long line of people waiting their turn for signatures was the appearance of retired Hall of Fame jockey and Racetrack Chaplaincy ambassador Pat Day, who talked shop with Turcotte and expressed his own memories and feelings about Secretariat and the champion’s timeless contribution to racing. 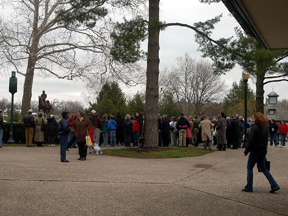 Many who attended the dedication took advantage of a rare group tour to Claiborne Farm in Paris, KY. 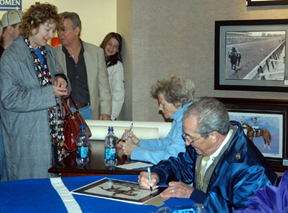 Participants had the opportunity to see predominant sires such as Pulpit, Seeking the Gold and South African Triple Crown winner Horse Chestnut as well as the famed stallion cemetery – where Secretariat and other legends of the turf are interred. At the tour’s conclusion, each participant received a commemorative gift of the day. 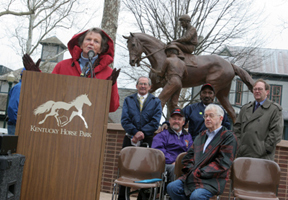 The Secretariat Bronze statue, a gift Penny Chenery envisioned for all who loved her Big Red, is located at the main entrance of the Horse Park, directly across from the famous Man o’ War statue – a location befitting the two greatest Thoroughbreds ever to set foot on a track. 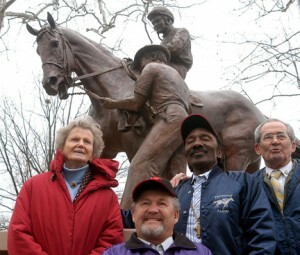 There they will remain to welcome all who love horses – two enduring symbols of the best of what was, what is, and what continues to be. 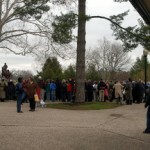 Photos courtesy of Matt Goins and Tina Hines.